Sensor-Technik Wiedemann has added an 80kW motor-generator to the powerMELA family of hybrid electric drive systems for use in heavy industrial and mobile machines. The new addition is the next step in building a series of drives and generators ranging in power from 20kW to 300kW. Similar to its predecessor 140kW model, the new 80kW powerMELA drive is characterised by an integrated inverter, compact size and ruggedness for use in mobile machines. 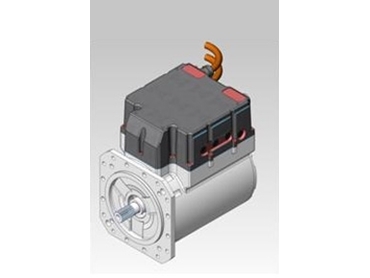 Delivering a continuous torque of 250 Nm and a power-to-weight ratio of 1kW per kilogram, the new range of drives has multiple applications in all areas of off-road and on-road vehicles. Together with control devices, brake chopper and battery management, Sensor-Technik Wiedemann offers the key system components for the electrification and hybridization of vehicles. The double insulated design of powerMELA power and drive components reduces the risk from electrical current and increases availability. While the 140kW powerMELA drives find application in snow plows, beet harvesters, winches and buses, the new, compact 80kW variant, which has a length of less than 400mm is aimed at auxiliary systems as well as axle and single wheel drives. The powerMELA drives are available from CAN Automotion .